Recycling C&D (construction and demolition) debris requires all the equipment normally needed for recycling concrete and asphalt rubble, plus other specialized elements in the system to handle such incoming items as wood, asphalt shingles, drywall, plaster, plastic, steel, paper, dirt and electrical wire. A concrete recycling system generally consists of a primary impact crusher, side discharge conveyor, screening plant, return conveyor and radial stacking conveyors. A C&D system typically will also include picking stations to remove many of the unwanted materials by hand. 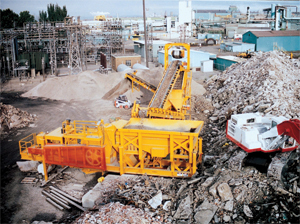 Other important options can include a wood shredder, a low-maintenance air sorting tower to segregate paper and wood from stone, an electromagnetic separator to remove ferrous metals, and water-based dust suppression at locations such as the feed hopper, screening plan and fines conveyor to minimize emissions. The heart of all concrete/asphalt and C&D recycling systems is the crusher, which absolutely must be a primary impactor. Jaw crushers and jaw/cone combinations are less efficient, durable and versatile in recycling applications. And secondary impactors “adapted” for recycling (usually just a larger feed opening) simply are overmatched in processing concrete and C&D debris. They will give their owners low production with high maintenance and downtime. In a recycling system, equipment quality is paramount. To handle the variety of materials coming through a C&D recycling operation, the screen plant should be a wet or dry, triple deck, horizontal or inclined type. The electromagnetic separator should be mounted in-line, rather than perpendicular, at the top of the side discharge conveyor to assure smooth material flow. The separator’s head pulley and splitter should be stainless steel, which cannot become magnetized. Grasan, of Mansfield, Ohio, produces C&D recycling systems and has more experience than any other US or Canadian manufacturer in the design and production of impactor recycling plants. All Grasan plants utilize Hazemag 1315 or 1515 primary impact crushers with hydraulic controls for more uniform products and 15% to 20% greater production and than same-size impactors with standard controls. Road-portable Grasan impact crushing plants are equipped with a skid-on, skid-off hopper and six independent hydraulic legs that provide complete operational support and infinite height and leveling adjustments. The crushing plant, screen plant and conveyors can all be set up in one day without crane assist.